Twenty three people signed up for the Sing-Along with Mele Fong – Pop Songs program on September 6 on Maui. “You are the highlight of my month,” commented a participant after the program. 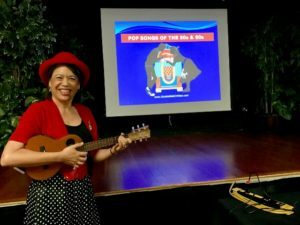 Twenty three people signed up for my monthly Sing-Along with Mele Fong Series – Pop Songs of the 50s & 60s on Thursday, September 6, 2018 at Kaunoa Senior Center for adults 55 and better on Maui. During the new “Hawaiian history moment of the month” I talked about Queen Lili’uokalani’s birthday on September 2, 1838. She was the last queen of the Hawaiian kingdom and died on November 11, 1917 at age 79. During her lifetime she composed Aloha ‘Oe which became her most famous composition. In 1999, Hui Hanai published “The Queen’s Songbook” as a compilation of her songs. The “Sing-Along with Mitch Miller” format of projecting the song lyrics and ‘ukulele chords on a screen at the front of the room, and having my husband provide the u-bass line to fill in the lower tones to the higher pitched ‘ukulele worked great! New this time we plugged in our wireless instrument inputs into the Center’s PA system so that I could play my ‘ukulele without being connected to cables. Plus, my husband plugged in our wireless headset so he could be heard as he sang-along in harmony. We continued the routine of telling the story behind each song and playing each song twice to reinforce what we learned. All I Have To Do is Dream – Morse Code Strum. My Girl – Latin Strum. Be My Baby – Boom Shaka I Wanna Strum. Can’t Help Falling In Love With You – Morse Code Variation Strum. Today – Waltz Strum and Pick in 6 Strum. If I Had a Hammer – Hum Ding-Ah Strum. Silhouette – I Wanna Rest Strum. Under the Palm Tree – Latin Strum. Lion Sleeps Tonight – I Wanna Rest Strum. From the Pop Songs Category – all but Under the Palm Tree and Hawaii Aloha. Stay tuned for the next Sing-Along with Mele Fong Series – Hawaiian Party Songs on Thursday, October 25.